AdvanStain Scarlet: Add Some Color to Your Westerns - Advansta Inc.
Are you ready to abandon housekeeping genes for normalizing your Western blots and move on to total protein staining? Then you might want to try AdvanStain Scarlet, Advansta’s fluorescent stain for gels and blots. 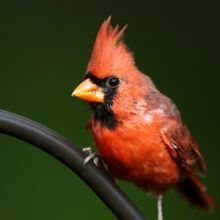 AdvanStain Scarlet was developed from a naturally occurring fluorescent compound called epicocconone. The dye reversibly binds to lysine, arginine and histidine residues in proteins and peptides resulting in an intensely red fluorescent product. You can perform staining either in the gel or on a PVDF or nitrocellulose membrane. Once the staining protocol is complete, shine some light on your gel or blot and image away. 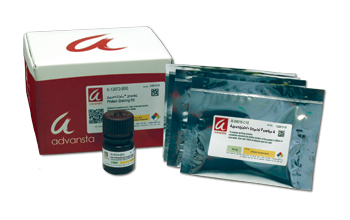 AdvanStain Scarlet can detect less than one nanogram of protein per band. AdvanStain has a large linear range, with a linear signal over 2 orders of magnitude. This allows linear detection of both high and low abundance proteins. Increase your chances of detecting low abundance proteins. AdvanStain Scarlet’s low background increases the signal to noise ratio. 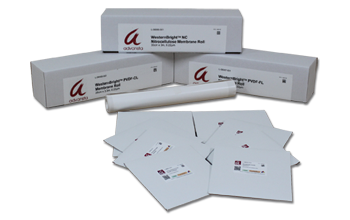 The AdvanStain Scarlet kit comes with all components necessary to complete the simple protocol. Fix, stain, wash and acidify in 3 hours or less and your gel/blot is ready to be imaged. Unlike other commercially available products, AdvanStain Scarlet is completely safe and biodegradable. The fluorescent dye can be excited with a variety of wavelengths including green (543, 532 nm), blue (488 nm), violet (405 nm) and UV (302, 365 nm). The maximum emission wavelength is 610 nm. can be washed away and is compatible with all downstream applications including Western blots and mass spectrometry. Once prepared, all components are stable for one year when stored at room temperature. Total protein staining with AdvanStain Scarlet is a simple way to normalize your Western blots. So don’t be afraid to turn red – throw away those housekeeping gene antibodies and try it out. Photo courtesy of Dawn Huczek.